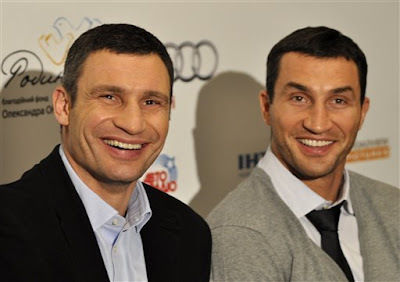 KIEV, Ukraine -- WBC champion Vitali Klitschko says he doesn't plan on becoming the oldest heavyweight titleholder in history because he wants to advance his political career in Ukraine. Ukrainian boxer Vitali Klitschko (L), with his brother Wladimir responds to questions in Kiev, Ukraine, Monday, March 12, 2012 during a news conference after the Ukrainian premiere of the documentary "Klitschko" , directed by Sebastian Dehnhardt, which follows their careers from childhood to heavyweight success. Asked Monday how long he intends to keep fighting, the 40-year-old Klitschko says "not a long time" and will instead "concentrate on politics because Ukraine has huge potential." George Foreman became the oldest heavyweight champion at age 45 in 1994, and Klitschko says "I definitely don't want to break George Foreman's record." Klitschko heads an opposition party called "Udar" (Strike) and wants to become Kiev mayor, a position he missed out on in 2006 when he ran on an anti-corruption platform. He will also take part in parliamentary elections later this year.